Using Qt Quick Controls to create an application window. Using the Package type with a DelegateModel to provide delegates with a shared context to multiple views. Using XML list models to download Flickr feeds. Using the Flipable type to create labels with different text on the front and back. Using the PathView, Path, PathAttribute, and PathLine types to lay out photos on a path. Providing feedback to users while data is loading. List elements are defined like other QML types except that they contain a collection of role definitions instead of properties. Roles both define how the data is accessed and include the data itself. 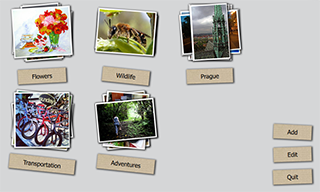 For each list element, we use the tag role to specify the photos to download. The named items are used as the delegates by the views that reference the special DelegateModel::parts property to select the model that provides the chosen delegate. property string tags : ""
The query property specifies that the XmlListModel generates a model item for each feed entry. The namespaceDeclarations property specifies that the requested document uses the namespace http://www.w3.org/2005/Atom, which is declared as the default namespace. When users select the Edit button, the album labels are flipped from their front side to their back side and the text on them changes from album name to Remove. The onTagChanged signal handler is used to change the tag based on which the model is populated. The onBackClicked signal handler is used to remove the album. The path property holds the Path type that defines the path used by the PathView. The PathAttribute types are used to set a range of 0 to 9999 for the z attribute. This way, the path creates a stack of album photos. Because each PhotoDelegate is slightly rotated at a random angle, this results in a realistic-looking stack of photos. We use a busy indicator and a progress bar to indicate activity while Flickr feeds and photos are being loaded. In your apps, you can also use the ProgressBar type from the Qt Quick Controls module. The example application is translated into German and French. The translated strings are loaded at runtime according to the current locale. We use the qsTr() command to mark the button labels translatable. We use the lupdate() tool to generate the translation source files and the lrelease() tool to convert the translated strings to the QM files used by the application at runtime. These files are stored in the i18n directory.